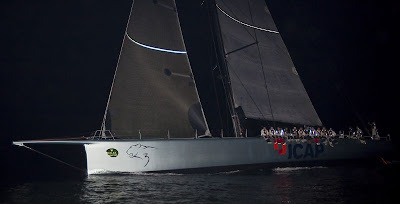 Property developer Mike Slade's ICAP Leopard secured a second consecutive line honours victory in the Rolex Fastnet Race in the early hours of this morning. With the mixed conditions the 100ft super-maxi was considerably behind the course record she set two years ago. Arriving at the Plymouth breakwater finish line at 00:09:36 GMT, her elapsed time on this occasion was 2 days 11 hours 9 minutes and 36 seconds, compared to 1 day 20 hours 18 minutes and 53 seconds in 2007.